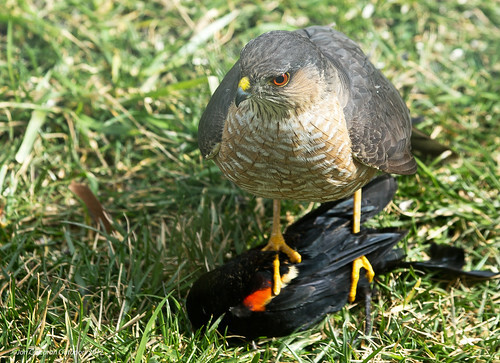 This is a small hawk, the size of an American Robin (male) or Rock Pigeon (female). The cap and upper parts are bluish-gray. The underparts are white with thin, horizontal, reddish-brown barring. Immature individuals are brown above with dark brown, vertical streaks on the breast and belly. The tail is relatively long and square at the end with a broad terminal band. It is bluish-gray above with black bars, pale below with dark bars. A high-pitched kik-kik-kik-kik lasting 2 to 4 seconds. 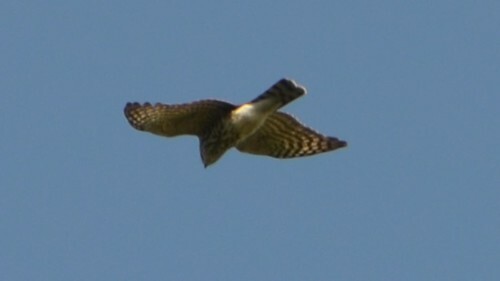 Cooper’s Hawk (Accipiter cooperii) is larger, 15″ to 19″ in length. The tail is square at the end and has a wider terminal band. March to mid-May and August to November. The following South American subspecies are often treated treated as separate species based on morphology, geographic isolation, “and probably behaviour”. The Sharp-shinned Hawk is a very small, stocky raptor of woodland habitats throughout North America. Like other Accipiters, this species ambushes its songbird prey (often at backyard bird feeders), and uses short, rounded wings to quickly maneuever through dense vegetation. Although secretive during the summer, this species is easily observed during the autumn as it passes over established "hawk watch" sites on its southbound migration. 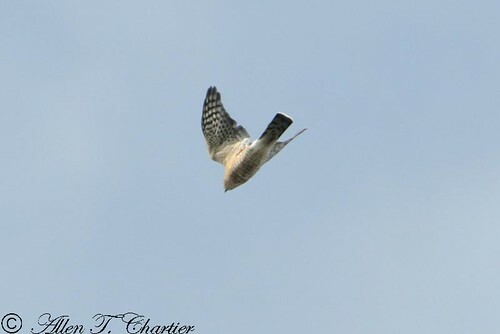 Sharp-shinned hawk video recorded by George Jameson. A male sharp-shinned hawk ( Accipiter striatus )torments house sparrows caught in a trap as he attempts to get a feathery snack on a sunny winter's day on the Colorado prairie. Learn more about the Raptor Education Foundation at www.usaref.org. Thank you.